The pressure relief valve DB4E-25X is a direct-acting, spring-loaded poppet valve with atmospheric relief. The spring exerts a force on the poppet and presses it on the valve seat. On the opposite side, the system pressure exerts a force on port 1 of the valve. If the hydraulic pressure is below the preset spring tension, then it closes the valve. 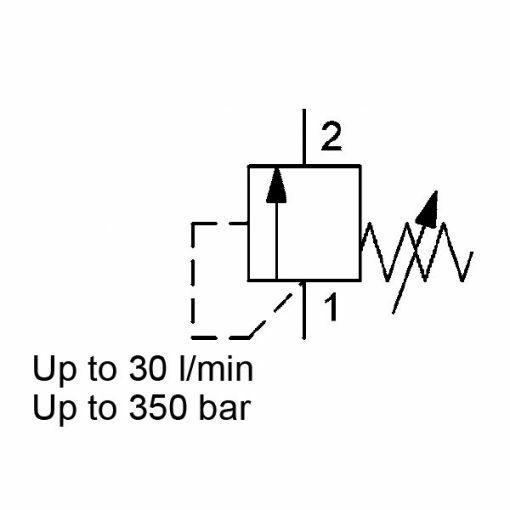 When the hydraulic force exceeds the preset spring tension, the valve opens and allows flow to the tank via port 2. This continues until the system pressure is equal to the spring tension and the valve closes again. Moreover, the pressures at port 2 have practically no effect on the opening pressure as ventilation of the valve to atmosphere happens in the spring chamber. So, to ensure maintenance of a stable operation, the location of the poppet is safe and in the damping piston which produces a damping force, opposing the direction of movement, and this has a stabilizing effect.